Geoffrey Palmer is seen here on 8 August 1989, the day that Labour’s caucus voted him in as prime minister. 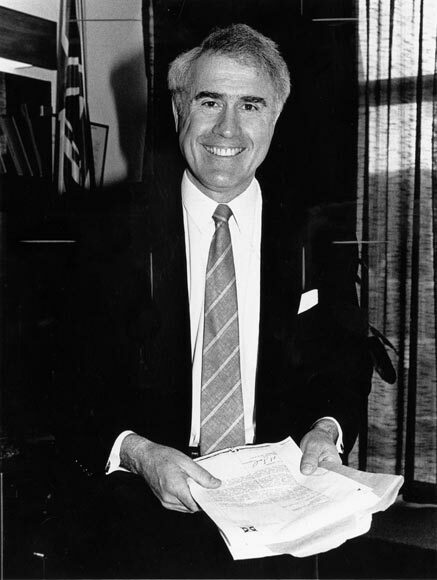 Originally from Waimea West, he was schooled in Nelson and went on to become deputy prime minister in 1984 and prime minister in 1989–90 following David Lange’s resignation. Palmer set up the royal commission that recommended switching to the Mixed Member Proportional (MMP) voting system and did major work drafting the Bill of Rights Act (1990) and the Resource Management Act (1991).